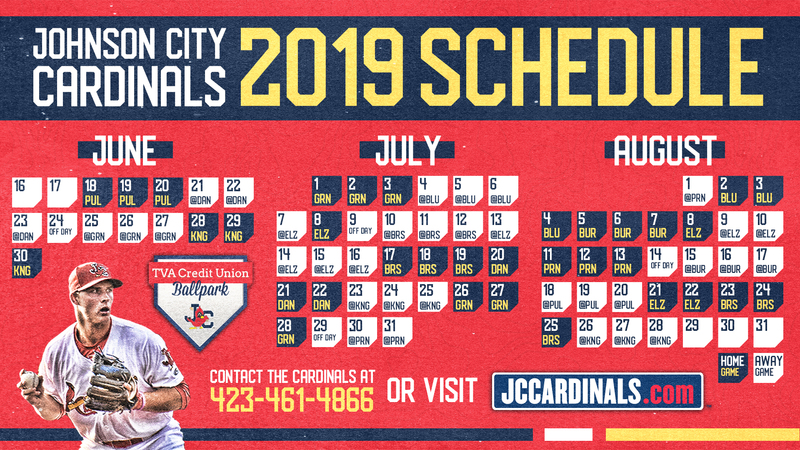 JOHNSON CITY, Tenn. - For the third time in three consecutive seasons, the Johnson City Cardinals have set their single-season attendance record. 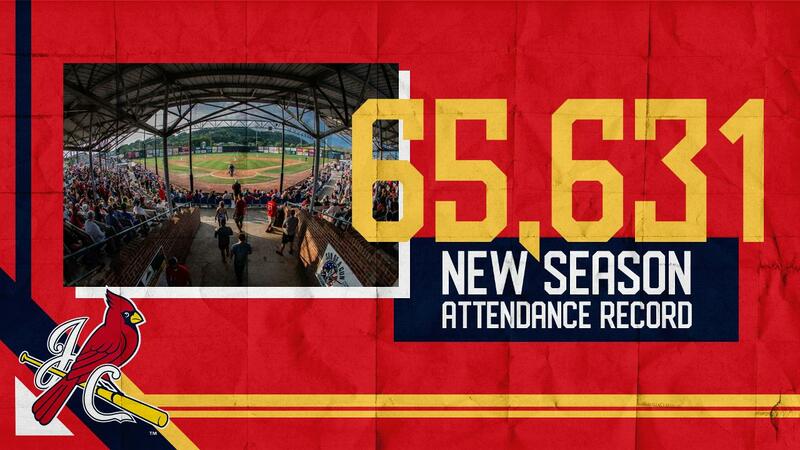 On Monday evening, August 27th, the Cardinals welcomed their 65,631st fan to TVA Credit Union Ballpark for the contest against the Kingsport Mets where 3,036 fans entered the ballpark. That mark surpassed last year's previous franchise-record of 65,202 fans. "To be able to break this record for a third year in a row has completely blown us away," said Cardinals General Manager Zac Clark. "We knew that we would be in for a great season, but the bar was set pretty high last season, so we knew we would have to have a special year to get back here once again. None of this would have been possible without the support of this community and the dedication of our fans. Also, our staff has worked extremely hard to see this record get broken again, and it shows that their hard work has paid off! To all that have been a part of this amazing ride, thank you so much! This community and our fans really are some of the best in the country!" In addition, the Cardinals have also broken their single-game attendance high 3 times over the course of the 2018 season. Most recently, the single-game attendance record was set on Saturday, August 25th with 4,167 fans entering the stadium. The record was previously set on July 2nd with 3,687 fans, and then again on July 3rd with a crowd of 3,947. After winning the series against Greeneville 2-1, the Cardinals needed a lot of help to make the 2018 playoffs. The Mets did their part by being swept by the Burlington Royals to keep the Cardinals playoff dreams alive. The Cardinals finish the season with a three-game series against the Mets, needing a sweep to get to the playoffs. The Cardinals stormed back to tie the game in the bottom of the seventh, but would fall in extra innings 8-6. The Mets drew first blood, scoring two in the top of the first, but the Cardinals would answer in the bottom of the first with one run. With one out, Liam Sabino walked and would reach second when Leandro Cedeno grounded out. Dariel Gomez singled with two outs, and Sabino would score from second to pull the Cardinals to within one, 2-1. The Cardinals took the lead in the bottom of the third, scoring two runs to take a 3-2 lead. Donivan Williams singled to start the inning and stole second during Liam Sabino's at-bat. With one out, Leandro Cedeno doubled (13) to score Williams and tie the game at two. Dariel Gomez was hit by a pitch and that put runners on first and second with one out. Michael Perri came to the plate with two outs and singled to score Leandro Cedeno from second to put the Cardinals ahead 3-2. David Oca got the start for Johnson City, his second of the season. Oca pitched 4.1 innings, allowing seven hits, five runs (2 earned), and struck out four hitters. The Mets scored two in the fourth, one in the fifth, and one in the seventh, while holding the Cardinals scoreless until the bottom of the seventh. The Cardinals were trailing 6-3 heading to the bottom of the seventh, but the theme of the season continued as their bats awakened late. Donivan Williams led off with a single. Then with one out, Leandro Cedeno blasted a two-run homerun (14) to make the score 6-5, and two batters later, with two outs, Andrew Warner launched a solo homerun (3) to tie the game at six. The game would go into extras, where the Cardinals have been great, going 3-1 in extra innings this season. The Mets scored two in the top of the tenth and won 8-6 to kill the Cardinals playoff hopes. The Cardinals used four pitchers after David Oca. Michael Brettell was first out of the bullpen. He threw two innings, allowing six hits, one earned run, and struck out four. Evan Sisk was second out of the bullpen, throwing 0.2 innings, allowing only one walk, and struck out one. Enrique Perez came in as the third reliever, throwing two innings, allowing two hits, one walk, and two strikeouts. The final reliever of the night was Jake Sylvester. Sylvester threw one inning, giving up two hits, two runs (one earned), and notching one strikeout and would take his second loss of the season (2-2). Game two will start at 7:00 p.m. on Tuesday and it will be the final Taco Tuesday of the 2018 season.